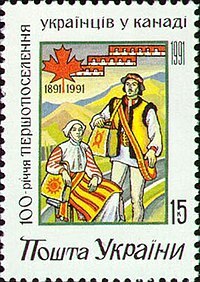 Ukrainian Canadians (Ukrainian: Українські канадці, Україноканадці, translit. Ukrayins'ki kanadtsi, Ukrayinokanadtsi; French: Canadiens d'origine ukrainienne) are Canadian citizens of Ukrainian descent or Ukrainian-born people who immigrated to Canada. In 2016, there were an estimated 1,359,655 persons of full or partial Ukrainian origin residing in Canada (the majority being Canadian-born citizens), making them Canada's eleventh largest ethnic group and giving Canada the world's third-largest Ukrainian population behind Ukraine itself and Russia. Self-identified Ukrainians are the plurality in several rural areas of Western Canada. According to the 2011 census, of the 1,251,170 who identified as Ukrainian, only 144,260 (or 11.5%) could actually speak either the modern Ukrainian language or the historic Canadian Ukrainian dialect. Minority opinions among historians of Ukrainians in Canada surround theories that a small number of Ukrainians settled in Canada before 1891. Most controversial is the claim that Ukrainians may have been infantrymen alongside Poles in the Swiss French "De Meurons" and "De Watteville" regiments who fought for the British on the Niagara Peninsula during the War of 1812 – it has been theorized that Ukrainians were among those soldiers who decided to stay in Upper Canada (southern Ontario). Other Ukrainians supposedly arrived as part of other immigrant groups; it has been claimed that individual Ukrainian families may have settled in southern Manitoba in the mid- to late 1870s alongside block settlements of Mennonites and other Germans from the Russian Empire. "Galicians" are noted as being among the miners of the British Columbia gold rushes and figure prominently in some towns in that new province's first census in 1871 (these may have been Poles and Belarusians as well as Ukrainians). Because there is so little definitive documentary evidence of individual Ukrainians among these three groups, they are not generally regarded as among the first Ukrainians in Canada. During the nineteenth century the territory inhabited by Ukrainians in Europe was divided between the Austro-Hungarian and Russian empires. The Austrian crownlands of Galicia and Bukovyna were home to many Ukrainian speakers. Austrian Galicia was one of the poorest and most overpopulated regions in Europe, and had experienced a series of blights and famines. Emigration on a large scale from Galicia to the Balkans (the north-south border region between Croatia and Bosnia) and even to Brazil was already underway by 1891. The first wave of Ukrainian immigration to Canada began with Iwan (Ivan) Pylypow and Wasyl (Vasyl') Eleniak, who arrived in 1891, and brought several families to settle in 1892. Pylypow helped found the Edna-Star Settlement east of Edmonton, the first and largest Ukrainian block settlement. However, it is Dr. Josef Oleskow,[N 1] along with Cyril Genik, who are considered responsible for the large Ukrainian Canadian population through their promotion of Canada as a destination for immigrants from western (Austrian-ruled) Ukraine in the late 1890s. Ukrainians from Central Ukraine, which was ruled by the Russian monarchy, also came to Canada – but in smaller numbers than those from Galicia and Bukovyna. Approximately 170,000 Ukrainians from the Austro-Hungarian Empire arrived in Canada from September 1891 to August 1914. This Ukrainian immigration to Canada was largely agrarian, and at first Ukrainian Canadians concentrated in distinct block settlements in the parkland belt of the prairie provinces: Alberta, Saskatchewan, and Manitoba. While the Canadian Prairies are often compared to the steppes of Ukraine, the settlers came largely from Galicia and Bukovyna – which are not steppe lands, but are semi-wooded areas in the foothills of the Carpathian Mountains. This is why Ukrainians coming to Canada settled in the wooded aspen parklands – in an arch from Winnipeg and Stuartburn, Manitoba to Edmonton and Leduc, Alberta – rather than the open prairies further south. As well, the semi-feudal nature of land ownership in the Austrian Empire meant that in the "Old Country" people had to pay the pan (landlord) for all their firewood and lumber for building. Upon arriving in Canada, the settlers often demanded wooded land from officials so that they would be able to supply their own needs, even if this meant taking land that was less productive for crops. They also attached deep importance to settling near to family, people from nearby villages or other culturally similar groups, furthering the growth of the block settlements. Fraternal and benevolent organizations established by these settlers include the Ukrainian Labour Farmer Temple Association (ULFTA, affiliated with the Communist Party of Canada), the Ukrainian Catholic Brotherhood (UCB, affiliated with the Ukrainian Catholic Church in Canada), and the Ukrainian Self-Reliance League (USRL, affiliated with the Ukrainian Orthodox Church of Canada). The ULFTA transformed itself into the Association of United Ukrainian Canadians in 1946, the UCB and USRL are part of the Ukrainian Canadian Congress today. By 1914, there were also growing communities of Ukrainian immigrants in eastern Canadian cities, such as Toronto, Montreal, Hamilton, and Windsor. Many of them arrived from the provinces of Podillia, Volhynia, Kyiv and Bessarabia in Russian-ruled Ukraine. In the early years of settlement, Ukrainian immigrants faced considerable amounts of discrimination at the hands of non-Slavic, non-Southern European Canadians, an example of which was the internment. From 1914 to 1920, the political climate of the First World War allowed the Canadian Government to classify immigrants with Austro-Hungarian citizenship as "aliens of enemy nationality". This classification, authorized by the August 1914 War Measures Act, permitted the government to legally compel thousands of Ukrainians in Canada to register with federal authorities. About 5,000 Ukrainian men, and some women and children, were interned at government camps and work sites. Although many Ukrainians were "paroled" into jobs for private companies by 1917, the internment continued until June 20, 1920 – almost a year after the Treaty of Versailles was signed by Canada on June 28, 1919. There are some two dozen Ukrainian-specific plaques and memorials in Canada commemorating Canada's first national internment operations, including several statues – on the fairgrounds of Canada's National Ukrainian Festival south of Dauphin, Manitoba, the grounds of the Manitoba Legislative Building in Winnipeg; and at the locations of the former internment camps in Banff National Park, Alberta, Spirit Lake (La Ferme), Quebec, and Kapuskasing, Ontario. Most were placed by the Ukrainian Canadian Civil Liberties Association (UCCLA) and its supporters. On August 24, 2005, Prime Minister Paul Martin recognized the Ukrainian Canadian internment as a "dark chapter" in Canadian history, and pledged $2.5 million to fund memorials and educational exhibits although that funding was never provided. On May 9, 2008, following the 2005 passage of Inky Mark's Bill C-331, the Government of Canada, under Prime Minister Stephen Harper, established a $10 million fund following several months of negotiation with the Ukrainian Canadian community's representatives, including the UCCLA, Ukrainian Canadian Congress and Ukrainian Canadian Foundation of Taras Shevchenko (also known as the Shevchenko Foundation), establishing the Canadian First World War Internment Recognition Fund (CFWWIRF). The Endowment Council of the CFWWIRF uses the interest earned on that amount to fund projects that commemorate the experience of Ukrainians and other Europeans interned between 1914 and 1920. The funds are held in trust by the Shevchenko Foundation. Amongst the commemorative projects funded by the Endowment Council was the unveiling, simultaneously across Canada, of 115 bilingual plaques on August 24, 2014, recalling the 100th anniversary of the first implementation of the War Measures Act. 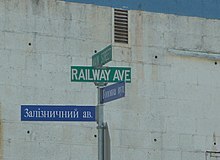 This was known as Project "Сто" (translit. Sto; meaning "one hundred"), and organized by the UCCLA. In 1923, the Canadian government modified the Immigration Act to allow former subjects of the Austrian Empire to once again enter Canada – and Ukrainian immigration started anew. Ukrainians from western Volhynia – the Polesie and Wołyń Voivodeships (under Polish rule), and southern Bessarabia – also known as the Budjak (under Romanian rule), joined a new wave of emigrants from Polish-governed Galicia and Romanian-governed Bukovyna. Around 70,000 Ukrainians from Poland and Romania arrived in Canada from 1924 to September 1939, although the flow decreased severely after 1930 due to the Great Depression. Relatively little farmland remained unclaimed – the majority in the Peace River region of northwestern Alberta – and less than half of this group settled as farmers in the Prairie provinces. The majority became workers in the growing industrial centers of southern Ontario and the Montreal region and the Eastern Townships of Quebec; the mines, smelters and forests of northern Ontario; and the small heavy industries of urban western Canada. A few Ukrainian professionals and intellectuals were accepted into Canada at this time; they later became leaders in the Ukrainian Canadian community. From World War II to 1991, most Ukrainians coming to Canada were political refugees and Displaced Persons who tended to move to cities in southern Ontario, southern Quebec and the Lower Mainland of British Columbia – there are now large Ukrainian communities in Toronto, Montreal and Vancouver. They established a number of new organizations and affiliated newspapers, women's and youth groups, the most prominent of which was the Canadian League for the Liberation of Ukraine (renamed the League of Ukrainian Canadians after the collapse of the USSR in 1991). The League joined the Ukrainian Canadian Committee (later Ukrainian Canadian Congress) in 1959. Relatively few Ukrainians came to Canada during the Brezhnev and Gorbachev years, as exit visas could take several years to get approved. After the dissolution of the USSR, emigration from Ukraine increased. Rising levels of corruption, the dismantlement of some social services, low-paying employment and loss of jobs in Ukraine, made immigration attractive once again. Having been separated from Ukraine, Ukrainian Canadians have developed their own distinctive Ukrainian culture in Canada. To showcase their unique hybrid culture, Ukrainian Canadians have created institutions that showcase Ukrainian Canadian culture such as Edmonton's Cheremosh and Shumka troupes – among the world's elite Ukrainian dancers; or the Ukrainian Cultural Heritage Village – where Ukrainian pioneer buildings are displayed along with extensive cultural exhibits. Ukrainian Canadians have also contributed to Canadian culture as a whole. Actress and comedian Luba Goy, singer Gloria Kaye, and painter William Kurelek, for example, are well known outside the Ukrainian community. Historically Ukrainian Canadians were among Canada's poorest and least educated minorities; but as the process of cultural integration has accelerated, this is no longer the case and Ukrainian Canadians are currently near the national economic average. Perhaps one of the most lasting contributions Ukrainian Canadians have made to the wider culture of Canada is the concept of multiculturalism which was promoted as early as 1964 by Senator Paul Yuzyk. During and after the debates surrounding the Royal Commission on Bilingualism and Biculturalism Ukrainian leaders, such as linguist Jaroslav Rudnyckyj, came out in force against the notion of English - French biculturalism which they believed denied the contributions other peoples had made to Canada. Partly in response to this, Prime Minister Pierre Trudeau shifted Canada to a policy of official multiculturalism. The Western Ukrainian agricultural settlers brought with them a style of folk architecture dominated by buildings made of unprocessed logs, which were much better suited to the wooded parkland belt rather than the "bald prairie". The first house built – usually a burdei – used some sod; but was not exactly a sod hut, more like a dugout. The second house was often a white-washed and plastered log cabin usually with thatched roof, very similar to those seen in Ukraine. Barns, chicken coops, granaries, and so on were all built using the same techniques as the houses. By the 1930s most Ukrainian Canadians adopted the building styles of the North American mainstream including framed homes and barns built from commercial plans and using milled lumber. Early churches, built by pioneer farmers rather than trained builders, were basically log cabins with a few added decorations. They aspired to the designs of Ukraine's wooden churches, but were much more humble. Latter churches – such as the "prairie cathedral" style of Father Philip Ruh, using a mixture of Byzantine and Western influences – were much more decorative. In addition to the official English and French languages, many prairie public schools offer Ukrainian language education for children, including immersion programs. Generally second language students are taught the local Canadian Ukrainian dialect, rather than Standard Ukrainian. The Canadian Ukrainian dialect is based on the Ukrainian spoken by the first wave of immigrants from the Austro-Hungarian Empire from 1891 to 1914. Because the Ukrainian language of this era had no words for such things as agricultural machinery other than a plow, words for wildlife or vegetation common to North America and uncommon in Ukraine, words related to the automobile or other self-propelled vehicles on roads, or words for internal combustion engine-powered or electrically-powered tools or home appliances of any kind, extensive borrowings and adaptations from Canadian English were independently made by Ukrainian settlers in the block settlements of the Prairies during their first decades in Canada. The decline of regular communication with relatives in Ukraine, especially the severe restrictions between 1939 and 1989, further isolated the Western Canadian Ukrainian dialect from an evolving Ukrainian language in Soviet Ukraine. Now, immigrants from Ukraine to Western Canada since 1991 speaking Ukrainian find the Canadian Ukrainian dialect old-fashioned and sometimes strange, for modern Ukrainian no longer uses some of the expressions and vocabulary common to the Canadian dialect – or, in the case of the Canadian loan words and adaptations, never did use, because Standard Ukrainian either invented other terms or borrowed and adapted from other languages, such as French, German or Russian. There are a few Ukrainian Catholic elementary schools in the Greater Toronto Area including St. Josaphat Catholic Elementary school (Toronto), Josef Cardinal Slipyj Elementary school (Etobicoke) and St. Sofia Catholic Elementary school (Mississauga); as well as Holy Spirit Eastern Rite Elementary School in Hamilton. Many Ukrainians fled Russia, Poland, and later, the Soviet Union, to find freedom and a better life in Canada. For them Canada became "an anti-Russia", where they could realize their political and economic ideas. Most Ukrainian Canadians were anti-Soviet, yet a minor group of Ukrainians has since 1910 supported Canadian socialism and contributed to the formation of the Communist Party of Canada, and formed a significant bloc within that group. They were also active in other Marxist organizations like the Ukrainian Labour Farmer Temple Association (ULFTA). Ukrainians also played a central role in the 1930s formation of the Co-operative Commonwealth Federation (CCF) and the 1960s formation of the New Democratic Party. Ukrainians were a notable portion of the Mackenzie–Papineau Battalion of Canadians who volunteered and fought in the Spanish Civil War on the side of the leftist republican government against the nationalist troops of Generalísimo Francisco Franco. Ukrainians in Canada at first supported the Liberal Party federally and provincially, a minority moved towards the 1930s protest parties of Social Credit and the CCF federally and provincially. The strident anti-communism of John Diefenbaker in the 1950s led the more nationalist-minded to support the federal Progressive Conservatives. Today's Ukrainian community tends to vote based on economic class interests and/or regional preferences. The nationalist movement, through the Ukrainian National Federation and the Canadian League for the Liberation of Ukraine, was also an important part of the community. After Ukraine became independent Canada was one of the first nations to recognize Ukraine. From 1992 to 1994, Ukrainian Canadians were vital in fundraising to purchase a building in Ottawa to house the Embassy of Ukraine. As well, Canada has recognized the Holodomor (Ukrainian Famine) as an act of genocide. Canada also sent many observers to Ukraine during the disputed 2004 presidential election (see: Orange Revolution). The Government of Canada as well as its provincial governments – especially the Ukrainian strongholds in Alberta, Manitoba and Saskatchewan – do much to support Ukraine's economic and political development. The Ukrainian Canadians had and have much more influence in Canadian society and policy than any other East European group; therefore they have had several prominent figures in top positions. Ray Hnatyshyn was the 24th Governor General of Canada (1990–1995) and the first Governor General of Ukrainian descent. Ukrainians were also elected leaders of Canada's prairie provinces: Gary Filmon was Premier of Manitoba (1988–1999), nearly simultaneously with Hnatyshyn, and Roy Romanow was Premier of Saskatchewan (1991–2001), also partly at the same time as Filmon and Hnatyshyn. Ed Stelmach became Premier of Alberta in 2006 as the third provincial prime minister of Ukrainian descent. He succeeded Ralph Klein (1992–2006), who had cabinets with many Ukrainian ministers. Stelmach himself is the grandson of Ukrainian immigrants and speaks fluent Ukrainian. He left office in October 2011. 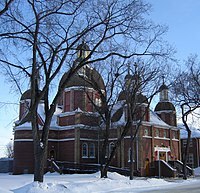 St. George's Ukrainian Catholic Cathedral, Saskatoon. St. Volodymyr's Ukrainian Orthodox Cathedral, Toronto. Most Ukrainians who came to Canada from Galicia were Ukrainian Catholic and those from Bukovyna were Ukrainian Orthodox. However, people of both churches faced a shortage of priests in Canada. The Ukrainian Catholic clergy came into conflict with the Roman Catholic hierarchy because they were not celibate and wanted a separate governing structure. At the time, the Russian Orthodox Church was the only Orthodox Christian church that operated in North America – because they had arrived first via Alaska, and traditionally Orthodox churches are territorially exclusive. However, Ukrainians in Canada were suspicious of being controlled from Russia, first by the Tsarist government and later by the Soviets. Partially in response to this, the Ukrainian Orthodox Church of Canada was created as a wholly Ukrainian Canadian-controlled alternative. As well the Ukrainian Catholic clergy were eventually given a separate structure from the Roman Church. The world's largest pysanka was erected in Vegreville, Alberta in 1974, commemorating the 100th anniversary of the Royal Canadian Mounted Police. Canada is home to some very vibrant Ukrainian dance groups. Some examples of Ukrainian dance ensembles in Canada are the Ukrainian Shumka Dancers and the Cheremosh Ukrainian Dance Company in Edmonton, the Rusalka Ukrainian Dance Ensemble and Rozmai Ukrainian Dance Company in Winnipeg, the Svitanok Ukrainian Dance Ensemble in Ottawa, and hundreds of other groups. The Ukrainian Canadian Foundation of Taras Shevchenko provides some financial support for Ukrainian Canadian performing, literary and visual arts. Ukrainians in general are noted for their elaborately decorated Easter Eggs or pysanky, and that is also true in Canada. The world's largest pysanka is in Vegreville, Alberta. Ukrainian Canadian churches are also famous for their onion domes, which have elaborately painted murals on their interior, and for their iconostasis, or icon walls. Ukrainian Canadian musicians and groups include Randy Bachman, the Canadian Bandurist Capella, Ron Cahute, Rick Danko, Victor Mishalow, Chantal Kreviazuk, Gordie Johnson, and Canadian Idol season 2 runner-up Theresa Sokyrka. The Edmonton-based group the Kubasonics focuses on a folk fusion of traditional Ukrainian music with modern touches. Cultural food is an important part of Ukrainian culture. Special foods used at Easter as well as Christmas are not made at any other time of the year. In fact on Christmas Eve (January 6[N 3] in the Gregorian calendar), a special twelve-dish meatless meal is served. The best-known foods are borshch (a vegetable soup, usually with beets), holobtsi (cabbage rolls), pyrohy or varenyky (dumplings often called "perogies"), and kovbasa (garlic sausage). Several items of Ukrainian food and culture have been enshrined with roadside attractions throughout the Prairie provinces. These are celebrated in the polka Giants of the Prairies by the Kubasonics. For example, the world's largest perogy is in Glendon, Alberta, and the world's biggest kovbasa is in Mundare, Alberta. the Ukrainian Canadian Congress – a national umbrella organization, established in 1940, represents the Ukrainian Canadian community. The UCC has branches and provincial councils across the country and has dozens of member organizations. The UCC leads and represents the Ukrainian Canadian community to the government of Canada and to the provincial governments. the Ukrainian National Federation of Canada, the largest Ukrainian Canadian organization founded in Edmonton in 1932 to unite Ukrainian Canadians on a non-sectarian basis for the prime objectives of preserving Ukrainian language and culture in Canada, promoting good citizenship, and supporting the establishment of an independent and democratic Ukrainian state. The UNF is a member of the Ukrainian Canadian Congress. the Ukrainian Canadian Foundation of Taras Shevchenko (Shevchenko Foundation) – based in Winnipeg, provides some financial support through grants for Ukrainian Canadian performing, literary and visual arts. the St. Petro Mohyla Institute in Saskatoon – a non-profit university student residence, Ukrainian culture summer school, and youth hostel. Ukrainian Canadian Social Services, a community agency providing nutritional and financial assistance to Ukrainian Canadian senior citizens. Map of the dominant self-identified ethnic origins of ancestors per census division. Actual physical origins of ancestors may be different. Ukrainian-plurality areas are highlighted in teal. Note that Ukrainians are a significant minority elsewhere, and that, numerically, most Ukrainian Canadians live in cities. Information in this section taken from 2006 Census Community Profiles. The Census Divisions with the largest percentage of Ukrainians are Manitoba #12 (25%), Alberta #10 (20%), Alberta #12 (19%), Manitoba #11 (15%), Manitoba #7 (13%), Manitoba #10 (12%), Manitoba #9 (12%), Manitoba #2 (10%). It is impossible to know which are proportionately the most Ukrainian municipalities in Canada since Statistics Canada does not release such information for communities with less than 5,000 people, and Ukrainians are the most concentrated in the smallest communities in the rural West. That being said, the following are communities (total greater than 5,000) with a high percentage of Ukrainians: Vegreville, Alberta (41%), St. Paul, Alberta (town) (31%), St. Paul County, Alberta (26%). Wikimedia Commons has media related to Ukrainian diaspora in Canada. ^ Dr. Oleskow, who had a PhD in agronomy, wrote two pamphlets – "About Free Lands" (Pro Vilni Zemli, spring 1895), and "On Emigration" (O emigratsiy, December 1895) – which were widely read in the Prosvita halls of the Ukrainian areas of the Austrian Empire. ^ The UCC was the driving force in organizing the World Congress of Free Ukrainians in the immediate postwar period; the WCFU would expand and be renamed the Ukrainian World Congress after the dissolution of the Soviet Union. ^ Because Ukrainian Canadians are the largest Eastern Christian group in Canada, January 6–7 is commonly referred by Canadians of all origins as "Ukrainian Christmas". ^ a b Statistics Canada. "2016 National Household Survey: Data tables". Retrieved 2 April 2018. ^ Swyripa, "Ukrainians", p. 1863; Martynowych 2011; Swyripa, "Canada", p. 348. ^ 2006 Census Community Profiles, see for example Division No. 12, Manitoba. ^ a b Swyripa, "Ukrainians", p. 1862. ^ a b Kukushkin, p. 30-54; Luciuk and Kordan 1989, map 3. ^ a b c Isajiw and Makuch, p. 333; Swyripa, "Ukrainians", p. 1862. ^ "The Quebec History Encyclopedia: Clifford Sifton". faculty.marianopolis.edu. Retrieved 8 January 2017. ^ a b c Swyripa, "Ukrainians", p. 1862; Luciuk and Kordan 1989, map 18; Isajiw and Makuch, p. 346-47, 345. ^ Swyripa, "Ukrainians", p. 1863; Luciuk and Kordan 1989, map 18; Isajiw and Makuch, p. 346-47, 345. ^ Swyripa, "Ukrainians", p. 1863; Luciuk and Kordan 1989, map 19; Isajiw and Makuch, p. 346-48. ^ Satzewich, V. (2004). The Ukrainian Diaspora. Taylor & Francis. ISBN 9780203217498. Retrieved 8 January 2017. ^ Allahar, A.; Côté, J.E. (1998). Richer and Poorer: The Structure of Inequality in Canada. James Lorimer Limited, Publishers. p. 70. ISBN 9781550286106. Retrieved 8 January 2017. ^ Subtelny, Orest (2000). Ukraine: A History. University of Toronto Press. p. 547. ISBN 9780802083906. Retrieved 8 January 2017. 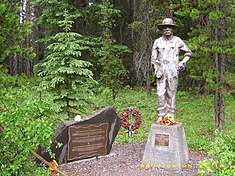 ^ "100 years since first death in Kapuskasing internment camp". Sudbury: CBC News. June 3, 2015. Retrieved 4 June 2015. ^ "About the Fund" (official website). The Canadian First World War Internment Recognition Fund and The Ukrainian Canadian Foundation of Taras Shevchenko. 2012. Retrieved 15 April 2014. ^ Swyripa, "Canada", p. 344. ^ a b Isajiw and Makuch, p. 333. ^ Swyripa, "Ukrainians", p. 1862; Isajiw and Makuch, p. 346-47, 345. ^ Swyripa, "Canada", p. 351; Luciuk and Kordan 1989, map 18. ^ Swyripa, "Ukrainians", p. 1862; Isajiw and Makuch, p. 346-48, 345; Luciuk and Kordan 1989, map 18. ^ Swyripa, "Canada", p. 351-52. ^ a b Swyripa, "Ukrainians", p. 1862–63; Swyripa, "Canada", p. 352. ^ Luciuk and Kordan 1989, map 18. ^ Swyripa, "Canada", p. 348. ^ a b Hans-Joachim Hoppe: (in German) "Ukrainian vastnesses – Canada was and is for many East Europeans a country of prophecy", in: Neue Zürcher Zeitung, no. 211, September 12/13, 2009, p. B3. ^ Popeski, Ron (6 January 2016). "Opinion – Should Ukrainians do away with Ukrainian Christmas?". CBC Manitoba. Retrieved 28 December 2017. ^ "Joyous, family celebration marks Ukrainian Christmas". Winnipeg Sun. Retrieved 8 January 2017. ^ University of Alberta Press. "Kule Folklore Centre". ^ "Ukrainian Canadian Social Services". ^ Infoukes.com. "Taras Shevchenko Museum - the only Shevchenko Museum in the Americas". Swyripa, Frances A. (1985). "Ukrainians". In Mel Hurtig. The Canadian Encyclopedia. Vol. 3 (1st ed.). Edmonton, Alberta: Hurtig Publishers. p. 1863. ISBN 0-88830-272-X. In 1981 only 30.0% and 18.6% of Ukrainian Canadians belonged to the Ukrainian Catholic and Ukrainian Orthodox churches, respectively; 16.8% were Roman Catholic and 13.3% United Church adherents. Martynowych, Orest (2011). "The Seraphimite, Independent Greek, Presbyterian and United Churches". Centre for Ukrainian Canadian Studies, University of Manitoba. Swyripa, Frances (1984). "Canada". In Volodymyr Kubiyovych. Encyclopedia of Ukraine. Vol. 1, A-F. Toronto: University of Toronto Press. p. 352. ISBN 0-8020-3362-8. A unique religious experiment originated with a Russian Orthodox priest, S. Ustvolsky. As the monk Seraphim, self-proclaimed bishop and metropolitan of the Orthodox Russian church for America, he arrived in Canada in 1903 and began to ordain priests. In 1904, alarmed by Seraphim's growing eccentricities, several priests, led by I. Bodrug, broke with him and formed the Ruthenian Independent Greek church. The new church retained the Eastern rite and liturgy but was supervised and financially supported by the Presbyterian church, with which Bodrug had contacts. At its height, the Independent Greek Church claimed 60,000 adherents. It declined after 1907 when Presbyterian pressure forced genuine Protestant reform; it became part of the Presbyterian church and then of the United church. Bodrug remained within the Ukrainian evangelical movement, working closely with the Ukrainian Evangelical Alliance in North America (est. 1922). In 1931, 1.6 percent of Ukrainian Canadians were United church adherents. By 1971 intermarriage and assimilation had increased the figure to 13.9 percent, the fourth-largest denomination among Ukrainian Canadians. Luciuk, Lubomyr; Kordan, Bohdan (1989). Creating a Landscape: A Geography of Ukrainians in Canada. Toronto: University of Toronto Press. p. Map 3. ISBN 0-8020-5823-X. Only about one-fifth of the Ukrainians in Canada would come from Ukrainian lands controlled by the tsarist empire until 1917 and by the Soviets thereafter. Isajiw, Wsevolod; Makuch, Andrij (1994). "Ukrainians in Canada". In Ann Lencyk Pawliczko. Ukraine and Ukrainians Throughout the World. Toronto: University of Toronto Press. p. 333. ISBN 0-8020-0595-0. Because most of the 'free' lands available for agricultural settlement had already been granted to earlier immigrants, the incoming population tended not to establish themselves as farmers. A substantial number settled in the Prairie provinces and worked as farm hands, while some took advantage of land grants being offered in the northern Peace River region of Alberta. Eventually, some of these immigrants did start up their own farming operations in and around the main areas of Ukrainian settlement. The majority of Ukrainians in this second wave, however, worked as labourers in the mining and forestry regions of northern Ontario and in the cities of central Canada and the Prairies. A small portion of the incoming immigration consisted of individuals with a higher level of education than that possessed by the earlier immigrants, affording them the opportunity to exact a different entry-level status. Among this group were skilled individuals who could assume critical positions in the Ukrainian press and the community's cultural-educational institutions. Swyripa, Frances (1984). "Canada". In Volodymyr Kubiyovych. Encyclopedia of Ukraine. Vol. 1, A-F. Toronto: University of Toronto Press. pp. 351–52. ISBN 0-8020-3362-8. Interwar immigrants introduced a number of new organizations. The paramilitary sporting Sitch [sic] (renamed the Canadian Sitch Organization in 1928) was founded in 1924 with official support from the Ukrainian Catholic church. It declined with the appearance of the Ukrainian Catholic Brotherhood and in 1934 was reorganized without church backing as the United Hetman Organization, a conservative monarchist movement that favored P. Skoropadsky as hetman of Ukraine. After the death of his son, D. Skoropadsky, in 1957 the movement, never too popular, rapidly declined. In 1928 the republican-inclined veterans of the Ukrainian independence struggle formed the Ukrainian War Veterans' Association (UWVA). In 1932 it provided the base for the Ukrainian National Federation, which espoused the militant nationalism of the Organization of Ukrainian Nationalists. Swyripa, Frances A. (1985). "Ukrainians". In Mel Hurtig. The Canadian Encyclopedia. Vol. 3 (1st ed.). Edmonton, Alberta: Hurtig Publishers. pp. 1862–63. ISBN 0-88830-272-X. National organizations emerged in the interwar years. The procommunist Ukrainian Labour-Farmer Temple Association (est. 1924) attracted the unemployed in the 1930s. The Ukrainian Self-Reliance League (est. 1927) and the Ukrainian Catholic Brotherhood (est. 1932) represented Orthodox and Catholic laity, respectively. Organizations introduced by the second immigration reflected Ukrainian revolutionary trends in Europe. The small conservative, monarchichal United Hetman Organization (est 1934) was counterbalanced by the influential nationalistic, republican Ukrainian National Federation (est. 1932). Despite tensions, all groups publicized Polish pacification and Stalinist terror in Ukraine in the 1930s; only the Ukrainian Labour-Farmer Temple Association condoned the Soviet purges and the artificial famine of 1932–33 that killed 6 million people; its successor, the Association of United Ukrainian Canadians (est. 1946), has declined steadily. Swyripa, Frances (1984). "Canada". In Volodymyr Kubiyovych. Encyclopedia of Ukraine. Vol. 1, A-F. Toronto: University of Toronto Press. p. 352. ISBN 0-8020-3362-8. During the 1930s there was considerable friction between the Canadian-oriented Ukrainian Catholic Brotherhood and Ukrainian Self-Reliance League and such Ukraine-oriented organizations as the Ukrainian National Federation. In spite of rivalries, Ukrainian-Canadian organizations gave moral and financial assistance to Ukrainian émigré centers in Western Europe and to Ukrainian veterans, war orphans, and numerous causes in Poland and neighboring countries. In the 1930s Polish pacification in Western Ukraine and Stalinist terror in the Soviet Union were widely publicized. The ULFTA, which extolled the Soviet Ukrainian state and especially its cultural flowering in the 1920s, failed to question the purges, forced collectivization, and artificial famine of the 1930s. Czuboka, Michael (1983). Ukrainian Canadian, Eh? : The Ukrainians of Canada and Elsewhere As Perceived By Themselves And Others. Winnipeg, Manitoba: Communigraphics / Printers' Aid Group. pp. 211–12. ISBN 0-920073-00-X. Gloria Kaye was born in northern Alberta as Gloria Slavka Kolmatycki on March 10, 1956, the youngest of five children of Mike and Annie Kolmatycki. [...] Kolmatycki changed her Ukrainian name to 'Kaye' for 'ease in handling.' As Gloria Kaye, she sang on Canadian television on the Tommy Hunter Show, It's Happening, Show of the Week, Juliette, Music Hop, Robbie Lane, and the Merv Griffin show in the United States. Swyripa, Frances (1984). "Canada". In Volodymyr Kubiyovych. Encyclopedia of Ukraine. Vol. 1, A-F. Toronto: University of Toronto Press. p. 348. ISBN 0-8020-3362-8. For many years Ukrainians supported the Liberal party, which was in power when they first arrived. Together with other Canadians from the lower socioeconomic strata, Ukrainians have shown considerable support for Canadian protest parties, which emerged in the 1930s – the Social Credit party and the Co-operative Commonwealth Federation (subsequently the New Democratic party). During the Great Depression the Ukrainians, Jews, and Finns were the most prominent ethnic groups within the Communist Party of Canada. In the late 1950s many Ukrainians turned to the Progressive Conservative party, approving J. Diefenbaker's anticommunism and his appointment of the first Ukrainian Canadian to the federal cabinet. Increasingly, the voting habits of Ukrainians reflect their economic class or region rather than any common ethnic pattern. Hoppe, Hans-Joachim Ukraine's conflict and the Ukrainian diaspora in Canada, Kyiv Post, September 5, 2015. Kordan, Bohdan and Luciuk, Lubomyr, eds. (1986). A Delicate and Difficult Question: Documents in the History of Ukrainians in Canada, 1899–1962, Kingston: Limestone Press. ISBN 0-919642-08-X. Kordan, Bohdan (2000). Ukrainian Canadians and the Canada Census, 1981–1996, Saskatoon: Heritage Press. ISBN 0-88880-422-9. Kordan, Bohdan (2001). Canada and the Ukrainian Question, 1939–1945, Montreal-Kingston: McGill-Queen's University Press. ISBN 0-7735-2230-1. Kulyk-Keefer, Janice (2005). Dark Ghost in the Corner: Imagining Ukrainian-Canadian Identity, Saskatoon: Heritage Press. ISBN 0-88880-497-0. Luciuk, Lubomyr and Kordan, Bohdan (1989). Creating a Landscape: A Geography of Ukrainians in Canada, Toronto: University of Toronto Press. ISBN 0-8020-5823-X. Luciuk, Lubomyr and Hryniuk, Stella, eds. (1991). Canada's Ukrainians: Negotiating an Identity, Toronto: University of Toronto Press. ISBN 0-8020-5978-3. Luciuk, Lubomyr (2000). Searching For Place: Ukrainian Displaced Persons, Canada and the Migration of Memory, Toronto: University of Toronto Press. ISBN 0-8020-8088-X. Lupul, Manoly, ed. (1984). Visible Symbols: Cultural Expression Among Canada's Ukrainians, Edmonton: Canadian Institute of Ukrainian Studies Press. ISBN 0-920862-27-6. Martynowych, Orest (1991). Ukrainians in Canada: The formative period, 1891–1924. Edmonton: Canadian Institute of Ukrainian Studies Press. ISBN 0-920862-76-4. Martynowych, Orest (ed.) (2011). "Ukrainian-Canadian History, 1891-Present: A List of English-language Secondary Sources (Monographs, Book chapters, Collections, Articles)." Centre for Ukrainian Canadian Studies University of Manitoba. Prymak, Thomas M. (1988). Maple Leaf and Trident: The Ukrainian Canadians During the Second World War. Toronto: Multicultural History Society of Ontario. Satzewich, Vic (2002). The Ukrainian Diaspora. Routledge. ISBN 0-415-29658-7. Swyripa, Frances (1999). Ukrainians. Encyclopedia of Canada's Peoples. Toronto: Multicultural History Society of Ontario. Ukrainian diaspora in Canada and U.S.